My Programs, Products, and Services are owned and operated by Kelly Dunlap, LLC (“Company”) The term “you” refers to any purchaser and/or user of any of my Programs, Products and/or Services. My Limited License to You. My Programs, Products, and Services and all the Program Materials are my property and/or my affiliates or licensors, and are protected by copyright, trademark, and other intellectual property laws. If you purchase or access any of my Program Materials through my Programs, Products or Services, you will be considered my Licensee. For the avoidance of doubt, all content obtained through me is my property, and you are granted a revocable, non-transferable license for personal, non-commercial use only, limited to you only. This means that you may not use my Programs, Products or Services or the Program Materials in a manner that constitutes an infringement of my rights or in a manner that has not been authorized by me. You are permitted to download and/or print free resources from my Website or e-mail correspondence, e-newsletters, or other publicly shared information that are NOT a part of any paid Program, Product or Service for your own personal or business use, but only provided that you give me credit by name, keep intact all copyright and other proprietary notices and, if used electronically, you must include the link back to the Website page(s) from which the information was obtained. You may also download and/or print Program Materials for your own personal use. However, you are not permitted to share, sell, reprint or republish any other of my Program Materials, including handouts, for resale or mass reproduction purposes for your own business use. Any trademarks, taglines, and logos displayed on Program Materials are trademarks belonging to me. All trademarks reproduced in this Website, which are not the property of, or licensed to me, are acknowledged on the Website. Any use including framing, meta tags or other text utilizing these trademarks, or other trademarks displayed, is strictly prohibited without my express written consent, or permission granted herein. For those trademarks, taglines, and logos for which you are granted permission to use, the trademark indicia must be included at all times. Any marketing or promotional tools and/or Program, Product or Service titles or any other title or information of ours bearing the trademark symbols (™) or ® may not be used by you for any reason without my express written permission. Information You Are Prohibited from Sharing with Others. As a Licensee, you understand and acknowledge that my Programs, Products and Services and the Program Materials have been created, developed or obtained by us through the investment of significant time, effort and expense, and that this information is a valuable, special and unique asset of mine which needs to be protected from improper and/or unauthorized use. You will not engage in improper and/or unauthorized use of my Programs, Products, Services and Program Materials. Improper and unauthorized use includes but is not limited to modifying, copying, reproducing, republishing, uploading, posting, transmitting, translating, selling, creating derivative works, exploiting, or distributing in any manner or medium (including by email or other electronic means) any Program Materials or any other information accessed or purchased through my Programs, Products or Services, or any other communications provided by us for your own personal use, business/commercial use or in any way that earns you money. You will not use my Programs, Products, Services or Program Materials in a manner that constitutes an infringement of my rights or in a manner that has not been authorized by us through my prior written consent. Limitations on Linking and Framing. You may establish a hypertext link to my Website or Content so long as the link does not state or imply any sponsorship, endorsement by, or ownership by in my Website or Content and does not state or imply that I are have sponsored, endorsed or have ownership rights in your website. However, you may not frame or inline link my Content without my written permission. Your License to Me. By posting or submitting any material on or through my Programs, Products, Services or Program Materials, such as comments, posts, photos, images or videos or other contributions, you are representing that you are the owner of all such materials and you are at least 18 years old. When you submit to me or post any comment, photo, image, video or any other submission for use on or through my Website, you are granting me, and anyone authorized by me, an unlimited, royalty-free, perpetual, irrevocable, non-exclusive, unrestricted, worldwide license to use, copy, modify, transmit, sell, exploit, create derivative works from, distribute, and/or publicly perform or display such contributions, in whole or in part, in any manner or medium, now known or developed in the future, for any purpose, and granting me the right to make it part of my current or future Programs, Products, Services and/or Program Materials. This right includes granting me use or exploitation of proprietary rights or intellectual property rights like copyright, trademark, service mark, trade secrets, patent rights or any other of your intellectual property rights under any relevant jurisdiction without any further permission from you or compensation by us to you. Media Release. By participating in my Programs, Products and Services, and using my Program Materials, including my Facebook community, you consent to photographs, videos, and/or audio recordings that may be made that may contain you, your voice and/or your likeness. In my sole discretion, I reserve the right to use these photographs, videos, and or/audio recordings and/or any other materials submitted by you to us in connection with your participation in my Program, Product or Services in my current or future Programs, Products or Services, and/or my marketing or promotional efforts, without compensation to you at any time, now or at any time in the future. When you apply for, enroll in, purchase or use my Programs, Products or Services, or Program Materials I may seek and collect personal data and information including but not limited to your name, e-mail address, phone number, billing information, credit card or payment information, demographic information, preferences, interests, or other personally-identifying information (“Confidential Information”). Program Materials, I take measures to protect the security of your Confidential Information both online and offline. However, due to the nature of the Internet, I cannot completely ensure or warrant the security of your Confidential Information or of any other data or information transmitted to us or through my services; therefore submitting Confidential Information, data or other information is done at your own risk. As a Licensee, you agree that you are using your own judgment in using my Programs, Products, Services and Program Materials and you agree that you are doing so at your own risk. my Programs, Products, Services and Program Materials are for informational and educational purposes only. You agree and understand that you assume all risks and no results are guaranteed in any way related to my Programs, Products, Services and Program Materials. My Programs, Products, Services and Program Materials are merely to provide you with education and tools to help you make your own decisions for yourself. You are solely responsible for your actions, decisions and results based on the use, misuse or non-use of my Programs, Products, Services and Program Materials. I take every precaution to protect my Programs, Products, Services and Program Materials. However, due to the nature of the Internet, I cannot completely ensure or warrant the security of the Programs, Products, Services and Program Materials or the contributions or information transmitted to us on or through my Website or my Programs, Products, Services and Program Materials. Submitting contributions or information on my through my Programs, Products, Services and Program Materials is done entirely at your own risk. I make no assurances about my ability to prevent any such loss or damage to you or to any other person, company or entity arising out of use of my Programs, Products, Services and Program Materials and you agree that you are assuming such risks. Medical Disclaimer. My Programs, Products, Services, and Program Materials are not to be perceived as or relied upon in any way as medical advice or mental health advice. The information provided through my Programs, Products, Services, and Program Materials is not intended to be a substitute for professional medical advice, diagnosis or treatment that can be provided by your own physician, nurse practitioner, physician assistant, therapist, counselor, mental health practitioner, licensed dietitian or nutritionist, member of the clergy, or any other licensed or registered health care professional. Do not disregard professional medical advice or delay seeking professional advice because of information you have read in my Programs, Products, Services, and Program Materials, or received from me. Do not stop taking any medications without speaking to your physician, nurse practitioner, physician assistant, mental health provider or other health care professional. If you have or suspect that you have a medical or mental health issue, contact your own health care provider promptly. I am not providing health care, medical or nutrition therapy services or attempting to diagnose, treat, prevent or cure in any manner whatsoever any physical ailment, or any mental or emotional issue, disease or condition. I am not giving medical, psychological, or religious advice whatsoever. Legal and Financial Disclaimer. My Programs, Products, Services, and Program Materials are not to be perceived or relied upon in any way as business, financial or legal advice. The information provided through my Programs, Products, Services, and Program Materials is not intended to be a substitute for professional advice that can be provided by your own accountant, lawyer, or financial advisor. I am not giving financial or legal advice in any way. You are hereby advised to consult with your own accountant, lawyer or financial advisor for any and all questions and concerns you have regarding your own income and taxes pertaining to your specific financial and/or legal situation. You agree that I are not responsible for your earnings, the success or failure of your business decisions, the increase or decrease of your finances or income level, or any other result of any kind that you may have as a result of information presented to you through my Programs, Products, Services, and Program Materials. You are solely responsible for your results. Earnings Disclaimer. You acknowledge that I have not and do not make any representations as to the health physical, mental, emotional, spiritual or health benefits, future income, expenses, sales volume or potential profitability or loss of any kind that may be derived as a result of your participation in this Program, Product, Services or Program Materials. I cannot and do not guarantee that you will attain a particular result, positive or negative, financial or otherwise, through the use of my Programs, Products, Services and Program Materials and you accept and understand that results differ for each individual. I also expressly disclaim responsibility in any way for the choices, actions, results, use, misuse or non-use of the information provided or obtained through any of my Programs, Products, Services or Program Materials. You agree that your results are strictly your own and I are not liable or responsible in any way for your results. Warranties Disclaimer. I MAKE NO WARRANTIES AS TO MY PROGRAMS, PRODUCTS, SERVICES, OR PROGRAM MATERIALS. YOU AGREE THAT PROGRAMS, PRODUCTS, SERVICES, OR PROGRAM MATERIALS ARE PROVIDED “AS IS” AND WITHOUT WARRANTIES OF ANY KIND EITHER EXPRESS OR IMPLIED. TO THE FULLEST EXTENT PERMISSIBLE PURSUANT TO APPLICABLE LAW, I DISCLAIM ALL WARRANTIES, EXPRESS OR IMPLIED, INCLUDING, BUT NOT LIMITED TO, IMPLIED WARRANTIES OF MERCHANTABILITY, FITNESS FOR A PARTICULAR PURPOSE, AND NON-INFRINGEMENT. I DO NOT WARRANT THAT THE PROGRAMS, PRODUCTS, SERVICES, OR PROGRAM MATERIALS WILL BE FUNCTIONAL, UNINTERRUPTED, CORRECT, COMPLETE, APPROPRIATE, OR ERROR-FREE, THAT DEFECTS WILL BE CORRECTED, OR THAT ANY PART OF THE WEBSITE, CONTENT ARE FREE OF VIRUSES OR OTHER HARMFUL COMPONENTS. I DO NOT WARRANT OR MAKE ANY REPRESENTATIONS REGARDING THE USE OR THE RESULTS OF THE USE OF MY PROGRAM, PRODUCT OR SERVICES MATERIALS OR ON THIRD-PARTY WEBSITES IN TERMS OF THEIR CORRECTNESS, ACCURACY, TIMELINESS, RELIABILITY OR OTHERWISE. Technology Disclaimer. I try to ensure that the availability and delivery of my Programs, Products, Services and Program Materials is uninterrupted and error-free, including my content and communications through methods like my Website, member forum, private Facebook groups, e-mail communications, videos, audio recordings, webinars, recorded webinars, teleseminars, recorded teleseminars, emails, downloadable Mp3 audio files, downloadable PDF printed transcripts, downloadable PDF handouts/slides, handouts, ebooks, or any other materials provided by me to you. However, I cannot guarantee that your access will not be suspended or restricted from time to time, including to allow for repairs, maintenance or updates, although, of course, I will try to limit the frequency and duration of suspension or restriction. To the fullest extent permitted by law, I will be not be liable to you for damages or refunds, or for any other recourse, should my Programs, Products, Services or Program Materials become unavailable or access to the them becomes slow or incomplete due to any reason, such as system back-up procedures, internet traffic volume, upgrades, overload of requests to the servers, general network failures or delays, or any other cause which may from time to time make my Programs, Products, Services or Program Materials inaccessible to you. Errors and Omissions. I make no warranty or guarantee as to the accuracy, timeliness, performance, completeness or suitability of the information in my Programs, Products, Services, and Program Materials. Every effort has been made to present you with the most accurate, up-to-date information, but because the nature of scientific research is constantly evolving, I cannot be held responsible or accountable for the accuracy of my content. You acknowledge that such information may contain inaccuracies or errors and I are not liable for any such inaccuracies or errors to the fullest extent permitted by law. Links to Other Websites. I may provide links and pointers to other websites maintained by third parties that may take you outside of my Programs, Products, Services or Program Materials. These links are provided for your convenience and the inclusion of any link in my Programs, Products, Services or Program Materials to any other website does not imply my endorsement, sponsorship, or approval of that website or its owner. I do not endorse and I am not responsible for the views, opinions, facts, advice, or statements provided by external resources referenced in my Website or its Content, or their accuracy or reliability. I assume no responsibility for errors or omissions caused by other websites that may be included my Programs, Products, Services or Program Materials. I have no control over the contents or functionality of those websites and so I accept no responsibility for any loss, damage, or otherwise that may arise from your use of them and therefore I do not guarantee the accuracy, completeness, or usefulness of any other website or their content. It is your responsibility to review the terms and conditions and privacy policies of those linked websites to confirm that you understand and agree with those policies. Indemnification. You agree at all times to defend, indemnify and hold harmless my Company, as well as any of my affiliates, agents, contractors, officers, directors, shareholders, employees, joint venture partners, successors, transferees, assignees, and licensees, as applicable, from and against any and all claims, causes of action, damages, liabilities, costs and expenses, including legal fees and expenses, arising out of or related to my Programs, Products, Services or Program Materials, or your breach of any obligation, warranty, representation or covenant set forth in these Terms and Conditions or in any other agreement with me. Limitation of Liability. I will not be held responsible or liable in any way for the information, products or materials that you request or receive through or on my Programs, Products, Services or Program Materials. I do not assume liability for accidents, delays, injuries, harm, loss, damage, death, lost profits, personal or business interruptions, misapplication of information, physical or mental disease, condition or issue, or otherwise, due to any act or default of anyone or any business, whether owners, staff, agents, joint venture partners, contractors, vendors, affiliates or otherwise, affiliated with me. I do not assume liability for any owners, staff, agents, joint venture partners, contractors, vendors, affiliates or otherwise who is engaged in rendering my Programs, Products, Services or Program Materials, or in any way or in any location. In the event that you use my Programs, Products, Services or Program Materials or any other information provided by us or affiliated with me, I assume no responsibility. Release of Claims. In no event will I be liable to any party for any type of direct, indirect, special, incidental, equitable or consequential damages for any use of or reliance on my Programs, Products, Services or Program Materials, or on those affiliated with me in any way, and you hereby release me from any and all claims; including, without limitation, those related to lost profits, personal or business interruptions, personal injuries, accidents, misapplication of information, or any other loss, physical or mental disease, condition or issue, or otherwise, even if I are expressly advised of the possibility of such damages or difficulties. 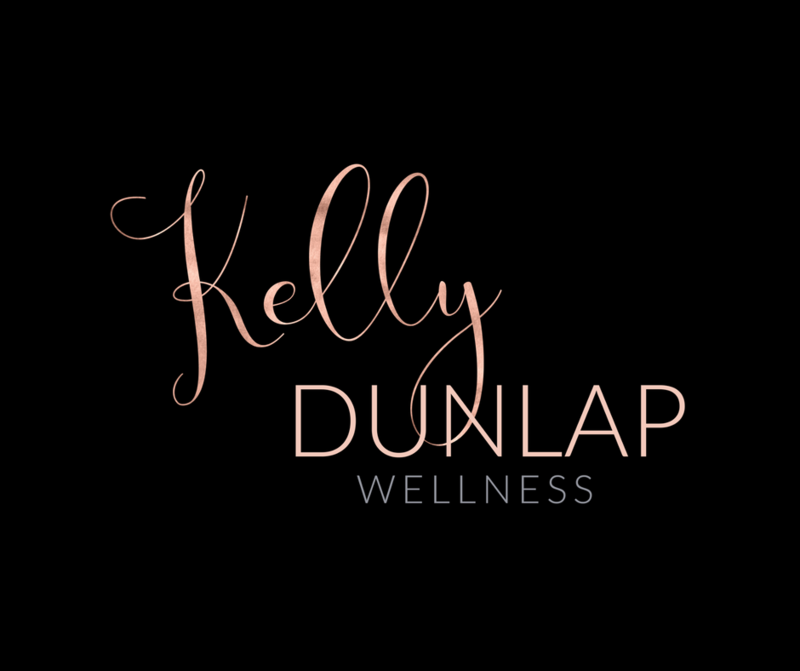 If you have a question or concern about your Programs, Products, Services, or Program Materials, you may send an e-mail to kelly@kellydunlapwellness.com and I will do my best to reply to your question or concern promptly. All information obtained during your purchase or transaction for my Programs, Products and Services and all of the information that you give as part of the transaction, such as your name, address, method of payment, credit card number, and billing information, may be collected by both us and my payment processing company. Payment processing companies and Merchants may have privacy and data collection practices that are different from mine. I have no responsibility or liability for these independent policies of the payment processing companies and Merchants. In addition, when you make certain purchases through my Programs, Products or Services, you may be subject to the additional terms and conditions of a payment processing company, Merchant or me that specifically apply to your purchase. For more information regarding a Merchant and its terms and conditions that may apply, visit that merchant’s Website and click on its information links or contact the Merchant directly. Your satisfaction with your Program, Product or Service is important to me. Yet, because of the extensive time, effort, preparation and care that goes into creating and/or providing my Programs, Products, Services and Program Materials, I have a NO REFUND POLICY. Unless otherwise provided by law, you acknowledge that I do not offer refunds for any portion of your payment for any of my Programs, Products, and Services, and no refunds will be provided to you at any time. By using and/or purchasing any of my Programs, Products, Services or Program Materials, you understand and agree that all sales are final and no refunds will be provided. You have the right to terminate your use of or participation in my Programs, Products or Services at any time by sending an e-mail to kelly@kellydunlapwellness.com. I reserve the right in my sole discretion to refuse or terminate your access to my Programs, Products, Services or Program Materials, in full or in part, at any time, without notice, by sending you an e-mail to the e-mail address you provided upon purchase of the Program, Product or Service. In the event of cancellation or termination by me, you will have 24 hours to pay any and all remaining payments or balances that are owed to us. Upon termination by me, I reserve the right to immediately refuse or terminate your access to any aspect of my Programs, Products, Services and/or my Program Materials, including but not limited to my Website, private forum, e-mail communications, Facebook groups, live webinars or conference calls, or any other method of communications related to my Programs, Products, Services or Program Materials at any time without notice and in my sole discretion. It is hoped that should I ever have any differences, I could be able to work them out amiably through e-mail correspondence. However, should I be unable to seek resolution within a reasonable time, you agree now that that the only method of legal dispute resolution that will be used is binding arbitration before a single arbitrator, selected jointly, in accordance with the American Arbitration Association Rules. Prior to seeking arbitration, you must send an e-mail to me at kelly@kellydunlapwellness.com and include all of your reasons for dissatisfaction with your Program. You understand and agree now that the only remedy that can be awarded to you through arbitration is full refund of your Payment made to date. No other actions or financial awards of consequential damages, or any other type of damages, may be granted to you. You agree now that the decision of the arbitrator is final and binding, and may be entered as a judgment into any court having the appropriate jurisdiction. By purchasing my Programs, Products or Services you are agreeing to a modification of the statute of limitations such that any arbitration must be begun within one (1) year of the date of the date of your e-mail to me referenced above or you waive the right to seek dispute resolution by arbitration or to take any other legal action. You also agree that should arbitration take place, it will be held in Michigan, where my business is located, and the prevailing party shall be entitled to all reasonable attorneys’ fees and all costs necessary to enforce the decision of the arbitrator. In the event of a dispute between us, you agree to not engage in any conduct or communications, public or private, designed to disparage me, my Company, or any of my Programs, Products or Services. Where requested by law or arbitration, of course, you are not prohibited from sharing your thoughts and opinions as a part of the legal process. What I Do With Confidential Information. I request and require various personal data and/or Confidential Information to understand your needs and provide you with better services. In addition, I may use such data and Confidential Information for the following reasons: (1) for internal record keeping, (2) to improve my Programs, Products, Services or Program Materials, (3) to periodically send promotions about new Programs, Products or Services or other special offers from which you may unsubscribe at any time, (4) for aggregate, non-identifiable data for research purposes, (5) to customize the respective Programs, Products or Services you purchase or use according to your interests and/or (6) for support or communication related to your Program, Product, Service or Program Materials. Storage. All data and Confidential Information is stored through a data management system. This data and Confidential Information can only be accessed by those who help manage that information in order to deliver e-mail or otherwise contact those who would like to receive my correspondence. You agree and acknowledge that I, including but not limited to my team, staff and affiliates, and those who manage the data management system may have access to your Confidential Information. Viewing by Others. Note that whenever you make your Confidential Information or Other Information available for viewing by others such as through my Programs, Products, Services, or Program Materials, my Website or social media, the Confidential Information or Other Information that you share also can be seen, collected and used others, and therefore, I cannot be responsible for any unauthorized use by others of such Confidential Information or Other Information that you voluntarily share online or in any other manner. Passwords. To use certain features of my Programs, Products, Services, or Program Materials, you may be issued a group username and password or a unique individual username and password, which you will receive through your registration and/or purchase process. You may be able to change to username and/or password of your choosing. You are responsible for maintaining the confidentiality of the password and account, and are responsible for all activities (whether by you or by others) that occur under your password or account. You are not permitted to share your username and/or password with anyone. If I learn you have shared your username and/or password with another person, I reserve the right to immediately terminate your access to the Program, Product, Service, Program Materials, Website, private forum, Facebook group or any other related communication. It is your responsibility to protect your own password from disclosure to others. I cannot and will not be liable for any loss or damage arising from your failure to protect your password or account information. You are responsible for activities that take place using your password(s) and within your account. If you share your password(s) with anyone, they may be able to obtain access to your personal information at your own risk. You agree to notify us immediately of any unauthorized use of your password or account or any other breach of security, and to ensure that you exit from your account at the end of each session. By using my Programs, Products and Services, you agree to enter true and accurate information as part of the registration, purchase process and otherwise. If you enter a false email address, I have the right to immediately inactivate your account. I will use my best efforts to keep your password(s) private and will not otherwise share your password(s) without your consent, except as necessary when the law requires it or in the good faith belief that such action is necessary, particularly when disclosure is necessary to identify, contact or bring legal action against someone who may be causing injury to others or interfering with my rights or property. 7. The Company shall use commercially reasonable efforts to restrict unauthorized access to my data and files. However no system whether or not password protected can be entirely impenetrable. You acknowledge that it may be possible for an unauthorized third party to access, view, copy, modify, or distribute the data and files you store using the Site. Use of the Site is completely at your own risk. 12. You agree to indemnify and hold the Company and each of its directors, officers employees, and agents, harmless from any and all liabilities, claims, damages and expenses, including reasonable attorney’s fees, arising out of or relating to (i) your breach of this Agreement, (ii) any violation by you of law or the rights of any third party, (iii) any materials, information, works and/or other content of whatever nature or media that you post or share on or through the Site, (iv) your use of the Site or any services that the Company may provide via the Site, and (v) your conduct in connection with the Site or the services or with other users of the Site or the services. The Company reserves the right to assume the exclusive defense of any claim for which I am entitled to indemnification under this Section. In such event, you shall provide the Company with such cooperation as is reasonably requested by the Company. 14. This agreement shall be governed by and construed in accordance with the laws of the State of Michigan, without giving effect to any principles of conflicts of law. You further submit to the exclusive jurisdiction of the state and federal courts sitting in Michigan If any provision of this agreement shall be unlawful, void, or for any reason unenforceable, then that provision shall be deemed severable from this agreement and shall not affect the validity and enforceability of any remaining provisions.